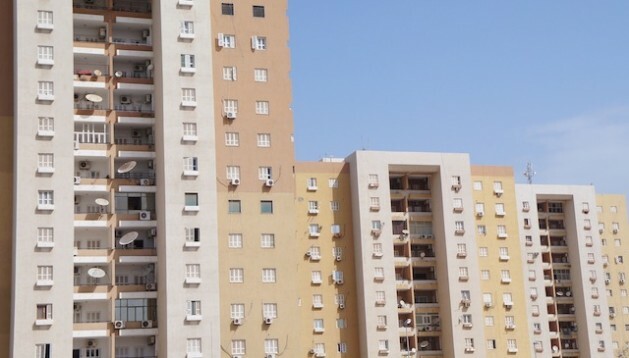 A housing estate in Tripoli. Property disputes have hit the Palestinian refugee community hard. Credit: Rebecca Murray/IPS. TRIPOLI, Aug 23 2012 (IPS) - Just before the overthrow of the Gaddafi regime one year ago, Huda and her Palestinian family were forcefully evicted from their Tripoli home. “This was last August and there was a lot of violence. There was no government. My husband had suffered a heart attack and we were scared,” says Huda, an anxious middle-aged woman clad head to toe in black. She breaks into tears. The original homeowner had his properties confiscated by the government in 1978 under the far-reaching housing Law 4, which decrees only one residence allowed per family. Originally from Acca in Palestine, Huda’s parents fled the violence in 1948 to south Lebanon. Three decades later, Huda and her husband escaped from another brutal war. They went to Libya on Lebanese travel documents, finally finding a job, house and stability. After shelling out nominal government rent for over three decades, Huda switched to paying the owner five times the amount. But when he died last year, his children came knocking to claim their inheritance. Since Libya’s revolution, property disputes have emerged as a primary threat to Libya’s national security. Although mostly relevant to Libyans, the crisis has hit the Palestinian refugee community hard. With more Palestinians arriving from Syria, it underscores the heightened vulnerability of their ‘guest’ status in the face of future government legislation. There are an estimated 45,000 to 70,000 Palestinians in Libya today. Statistics are hard to pin down especially after last year’s conflict, because many fled the country, are internally displaced or have irregular status. A signatory to the 1965 Casablanca Protocol, which protects Palestinian rights in Arab states, Libya has generally welcomed Palestinian refugees from across the region, including Gaza and Lebanon. Many have provided skilled labour for Libya’s oil and gas industry, and received subsidised housing, free education and healthcare. Although Gaddafi trumpeted the Palestinian cause – variously favouring one Palestinian faction over the other, including recruiting a Palestinian mercenary force for his war with Chad – the population also suffered the brunt of his political grandstanding in a series of mass-expulsions. Gaddafi’s political media stunt in 1995-96 to prove the Oslo Accords a sham was disastrous, resulting in thousands of Palestinians expelled, and thousands more stranded in tents at the border with Egypt. Many Palestinians who managed to return to Libya found they had lost their relative safety of subsidised homes and jobs, exacerbating their insecure status and displacement. Dr. Elena Fiddian-Qasmiyeh, a researcher at the Refugee Studies Centre at Oxford University, says when the revolution kicked off in 2011, it was a frightening time for Palestinians, who staked out a position as bystanders. “A few individuals I spoke to claimed they were being attacked by pro-regime forces for not engaging in armed activities, or being attacked by the anti-regime movement because of an assumed association with the pro-regime,” she says. The Palestinian community had the sting of Gaddafi’s ‘Oslo’ expulsions fresh in their minds. Dr. Al Mutawakel Taha, the new Palestinian Ambassador to Libya, says the biggest challenge is that more than half the Palestinians carry expired documents because they are afraid to report to authorities. Taha predicts the new government’s free market policies will drive up prices for Palestinians by eliminating food subsidies, and will narrowly define who can receive free health, education, housing and utilities. An obvious casualty will be Anwar, a 67-year old Palestinian, who came to Libya from south Lebanon in 1972. Recently evicted from his house, he says the former owner waved a piece of paper in his face and told him to leave. Anwar now struggles to support his wife and children in an apartment with a much higher rent. Four of his children suffer genetic disabilities – and are entirely dependent on their parents and Libya’s health care system. Housing Law 4 is still on the books, with new a legislative proposal awaiting the incoming government’s decision. Shakr Mohamed Dakhil spearheads the growing Libyan Property Owners Advocate’s Association, composed of those who had their properties confiscated by Gaddafi. He admits it is challenging to control some of his members from resorting to violence. Ambassador Taha says he met Dakhil’s group, and is waiting for them to draw up a list of all Palestinians living in disputed properties so he can determine their economic status, case by case. He has also amicably moved his embassy from Dakhil’s childhood villa to a new site. Big problems ahead but I pray that legitimate owners and occupants will not forget the human within.